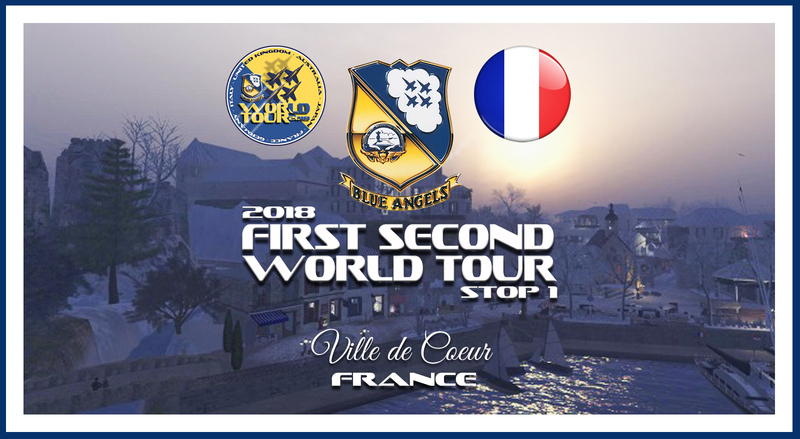 Without further ado, the Navy Flight Demonstration Team flew to France for the first leg of the 2018 Blue Angels First Second World Tour! Following contacts between the Blues and the Mayor of the beautiful Ville de Coeur community, Madame le Maire Ayla Panacek-Guisse invited the squadron to stop by on the 14th of July no less, on our way to Paris where the first demo of the World Tour will take place early September. 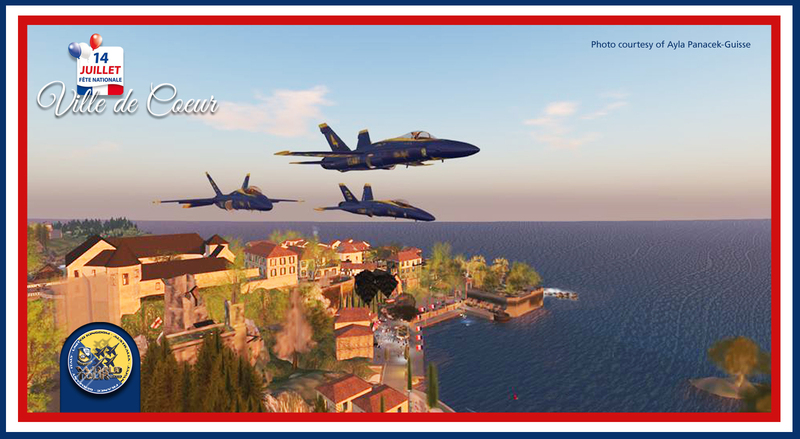 We were of course honored to fly over the French community on their national holiday and join the celebration. The squadron flew in with Fat Albert and the big bird would be a part of the fly over, on its second official appearance with the Blue Angels this Season. This is a record of the event which we enjoyed very much! Vive la France! CAPT. 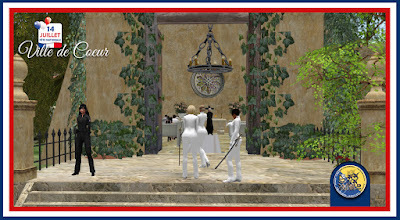 Kron and Madame le Maire Ayla Panacek-Guisse early 14th at the lovely town square on Aquitaine Coeur Nord discuss the fly over and the Quatorze Juillet celebrations at Ville de Coeur. Angel 7 on the small airstrip at Coeur Franche Comte, from where the squadron would take off, warms up for a test run. Initial assessment proved the flight to and from the fly over regions to be a challenge. The notes taken would prove very useful for the demo team later on. 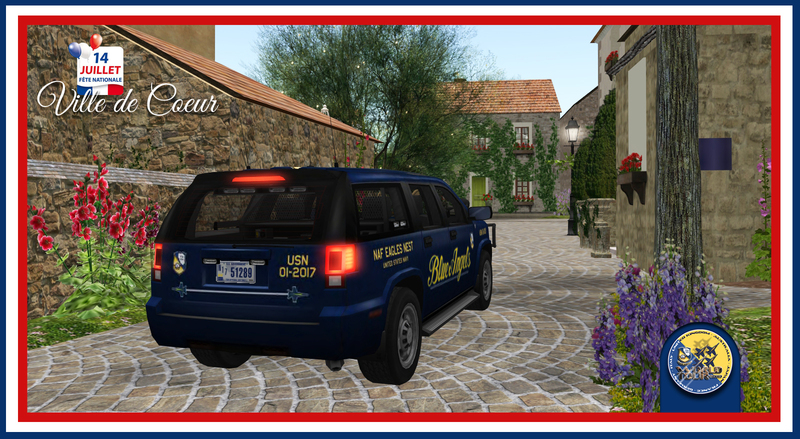 The Blues tour Ville de Coeur in one of the squadron's land vehicles. Going through the path from Coeur Franche Comte to Aquitaine Coeur Nord using the local roads was a wonderful experience. 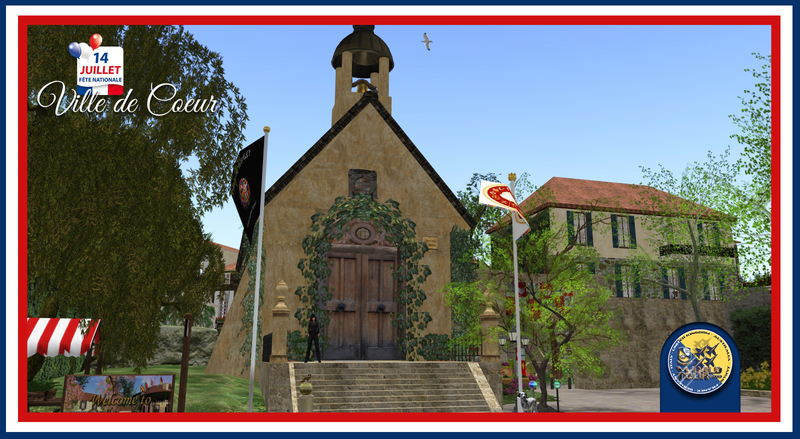 Ville de Coeur is a lovely community and the details are astounding. A must for all who appreciate locations that mirror real life. 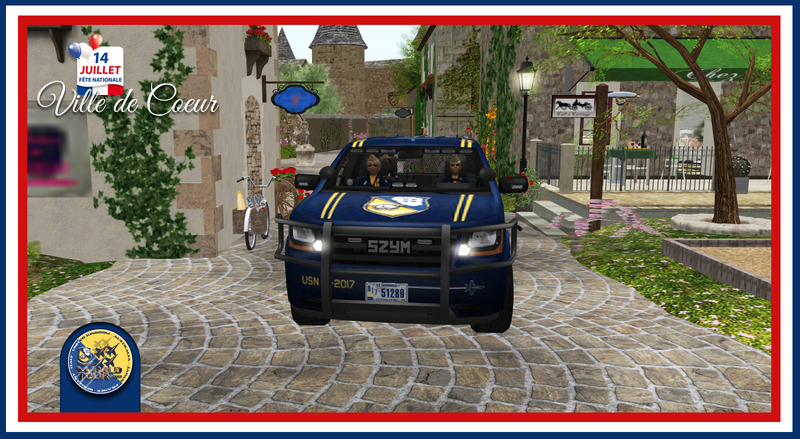 You feel like driving through the French country side for real! 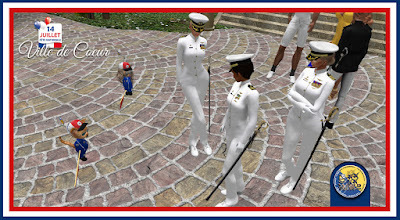 Just in time for the first event of the day's celebrations, the Blues decide to walk the rest of the way as the local citizens and guests gather up ahead. A quick change of uniform to match the occasion was in order. From left, CAPT. Kron, CDR. Rainbow, LCDR. Kaz and walking towards them the Boss, CAPT. Kühn, in their navy full dress whites. Major van Dongen would come in later on. 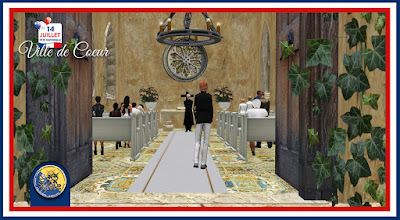 The beautiful Eglise d'Aquitaine where the service took place. The Blues remove their covers as they enter the church where many of Ville de Coeur citizens were already. They are greeted by the local head of security, Cathrine Huntress. 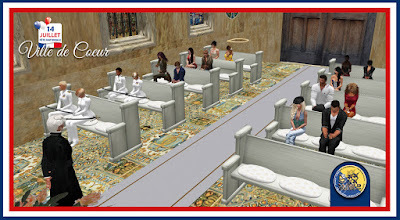 The congregation assembled at the Eglise d'Aquitaine as the service started. Pére Magnus Brody, the local priest, performed the service on voice with beautiful musical choices to punctuate the religious ceremony. A lovely parish and wonderful event. A moment of introspection during King's College Choir rendition of "Be Thou My Vision". Ville de Coeur's first couple during the service: Madame le Maire Ayla Panacek-Guisse and her husband, Bedrich Panacek-Guisse. The Blues in full dress whites sitting at the Eglise d'Aquitaine. View of the congregation from the outside through the beautiful stained glass rose window above the altar at the Eglise d'Aquitaine. 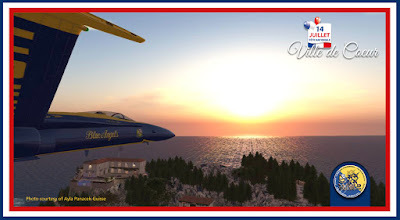 Major van Dongen, Blue Angel #8 and Fat Albert Airlines captain arrives at the Eglise d'Aquitaine. 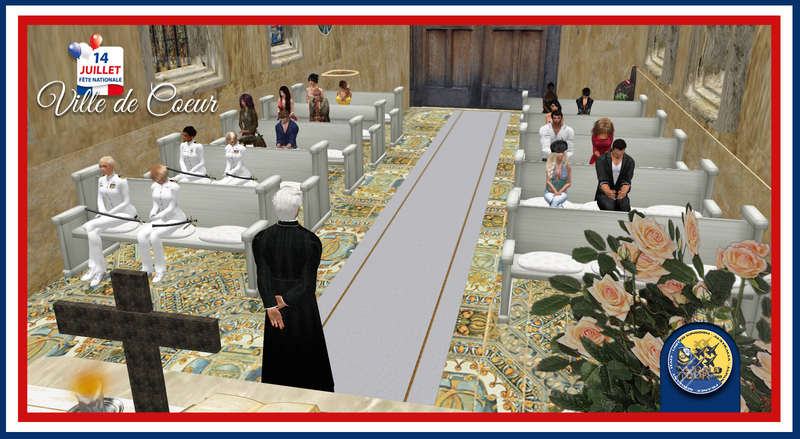 Standing for the Lord's word as Pére Brody reads from the scriptures. "Thanks be to God." 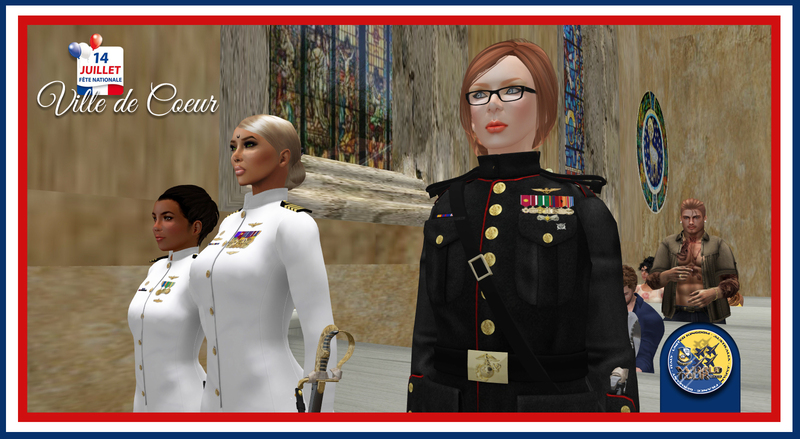 USMC Major Dominique van Dongen, who the Blue Angels have to thank for the presence at this wonderful location en route to Paris on this year's Bastille Day, stands with her fellow officers in her Marine Corps full dress uniform. One of the best newbies the Blues ever had. 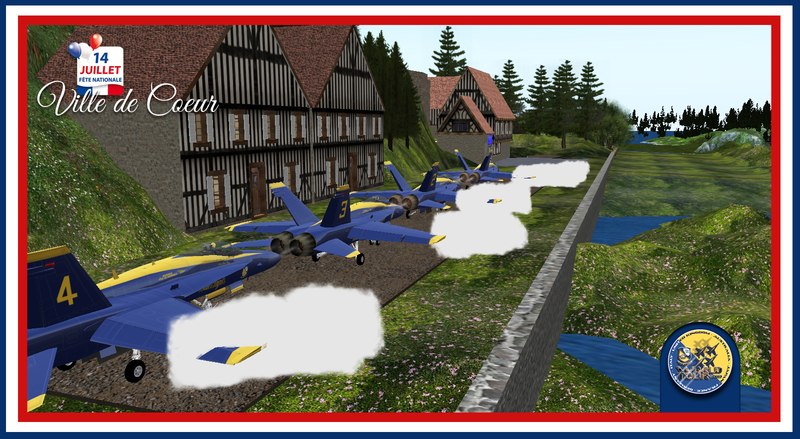 The Blue Angels at the Eglise d'Aquitaine, as the service comes to an end, stand at attention for "La Marseillaise". 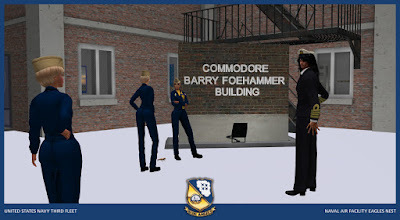 From left, CAPT. Vickster Kühn, LCDR. Jenny Kaz, CDR. An Rainbow, CAPT. Asra Kron and Major Dominique van Dongen. 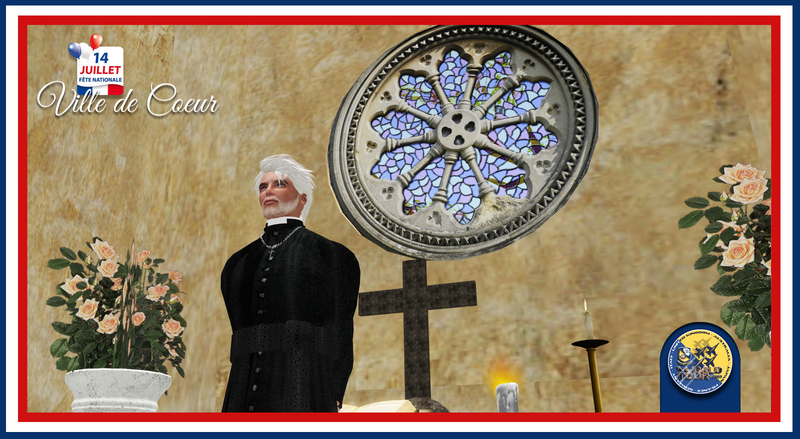 "Allons enfants de la Patrie! 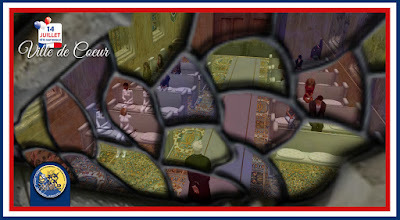 Le jour de gloire est arrivé!..." Outside the Church after the service, the Blues run into two of their most ardent fans: the little cats Tanja Byron and Newbienchen Zane! They follow the squadron everywhere! 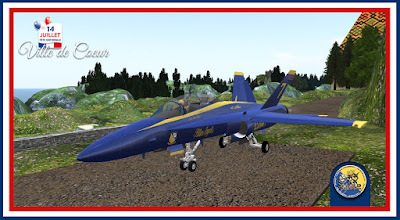 Back at the airstrip on Coeur Franche Comte, final inspection of the F/A-18C Hornets as take off time nears. 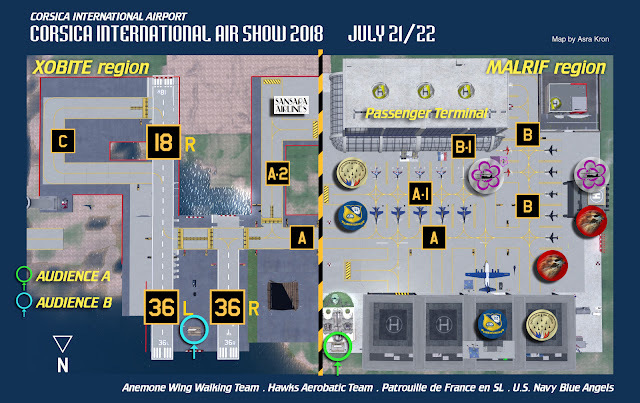 The jets would take off first and wait for Fat Albert to join them before heading South to the fly over area above Coeur Azur and Aquitaine Coeur Nord. Before the flight, CAPT. 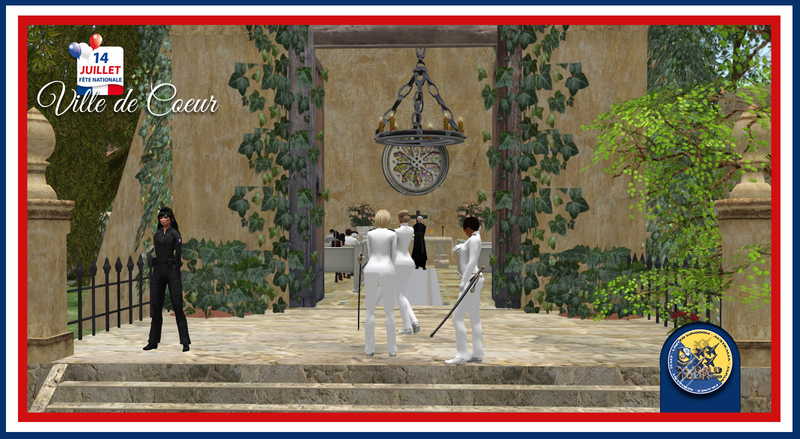 Asra Kron reveals the evocative plaque the Blues would later gift the French community. Big smiles on every face. Boarding the aircraft. T minus five minutes. 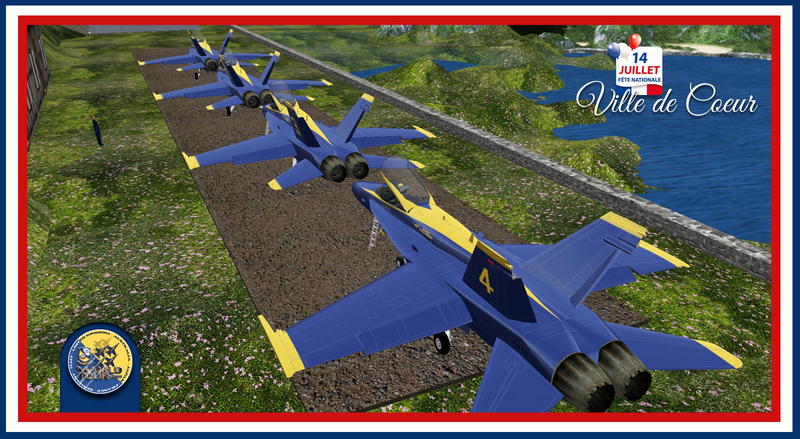 The small airstrip was long enough to accommodate the four blue and gold jets. Just! The Blues static at the end of preflight as the smoke check was done. 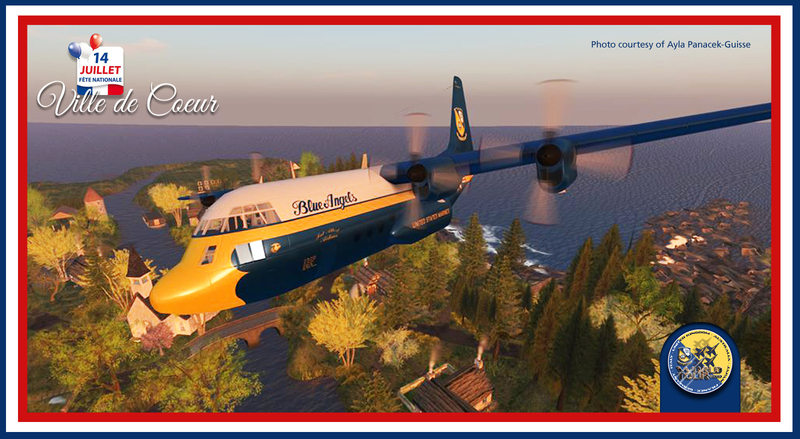 Fat Albert takes off from Coeur Franche Comte and joins the Hornets over Coeur d'Alsace. 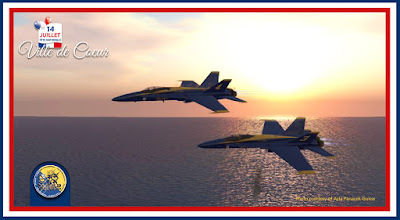 The squadron was then ready to fly South. Bird's eye view of Angel 4 as it approaches Aquitaine Coeur Nord. The Boss didn't make it into Coeur Azur, and Blue Angel 4 took over the lead. All in a day's work for the Blues. You roll with it and fly right no matter what. Fat Albert literally having a blast over the crowd assembled at Aquitaine Coeur Nord, lighting up flares as the C-130 flies over the beautiful town. The Boss was not the only one having difficulties that day. Blue Angel 2 had a share of rough weather over Coeur Azur. 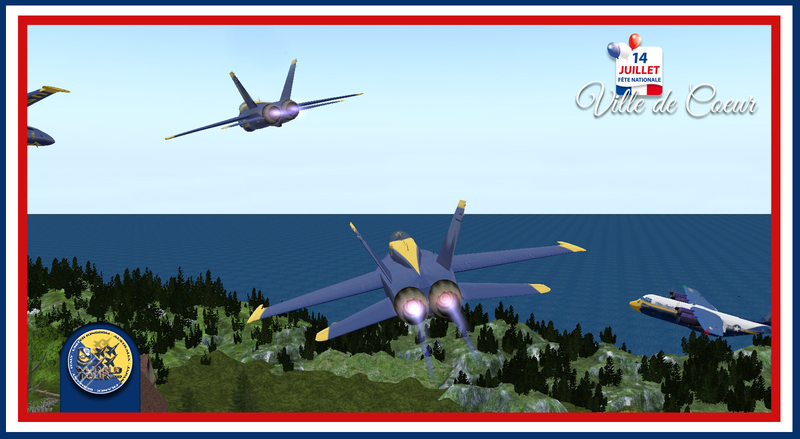 Here Blue Angels 4 and 3 hang tight as number 2 recovers. 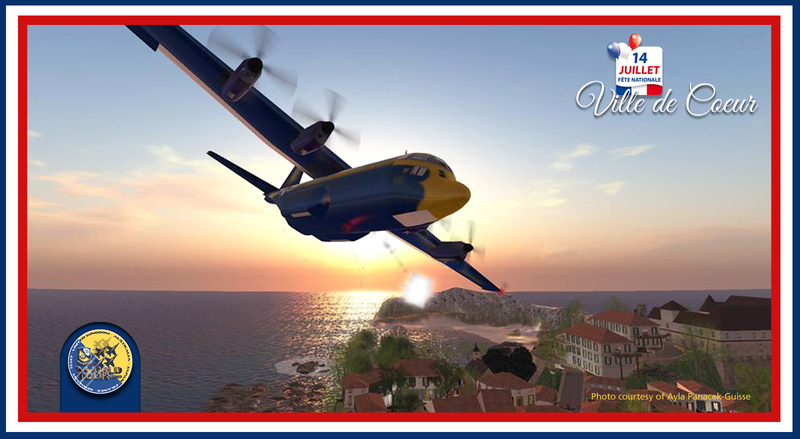 Major van Dongen and good old Fat Albert did very well! One final pass and back to Coeur Franche Comte, this time ahead of the jets. 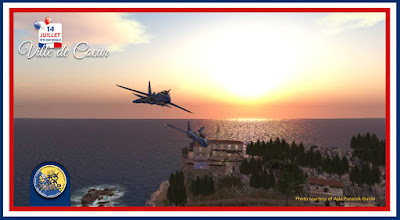 The three remaining Blues on the final pass over Coeur Azur. 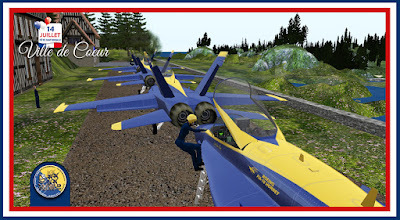 Blue Angel 4 would have a taste of the bad weather conditions on Aquitaine Coeur Nord right at the end of the fly over. But the deed was done! 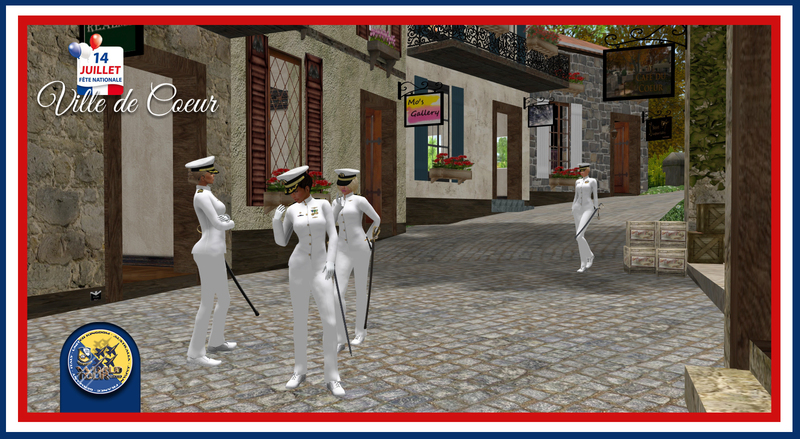 Returned to the airstrip on Coeur Franche Comte, the Blues change back into full dress uniform to join the celebrations on Aquitaine Coeur Nord's central square. The World Tour had officially started! Assembling on the edge of the square at Aquitaine Coeur Nord. 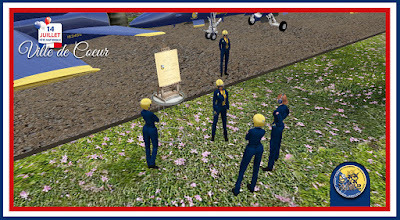 The Blue Angels salute Madame le Maire Ayla Panacek-Guisse and her husband as they present the evocative plaque marking the occasion. An accordéon playing, good wine and cheese, beautiful people... The Blues party with the locals and guests as the fireworks go off above them. 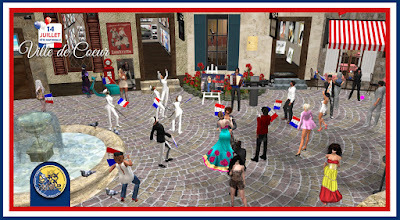 The general view of Aquitaine Coeur Nord's central square as the celebration went on. 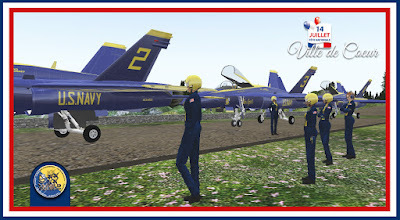 The Blue Angels had a great time at Ville de Coeur and we are honored to have been invited to participate in the local Bastille Day commemoration. "Bon Quatorze et au revoir, Ville de Coeur!" 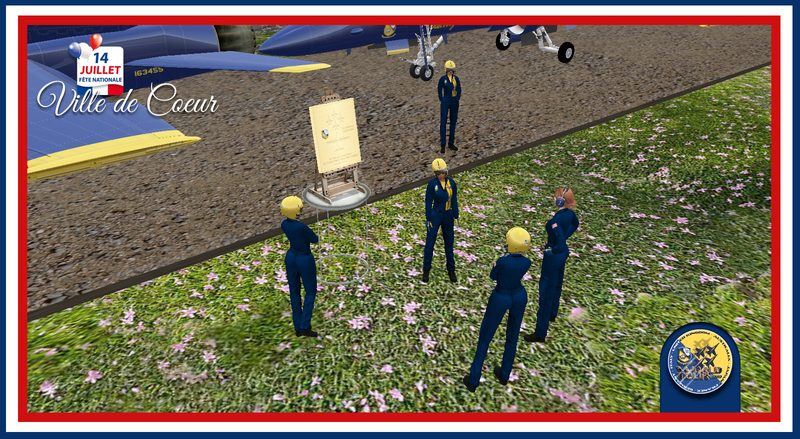 This photo was sent to us the day after by Madame le Maire Ayla Panacek-Guisse, showing her by the Blue Angels gift as it sits on a wall of one of Ville de Coeur's gardens! Merci bien, Madame le Maire! 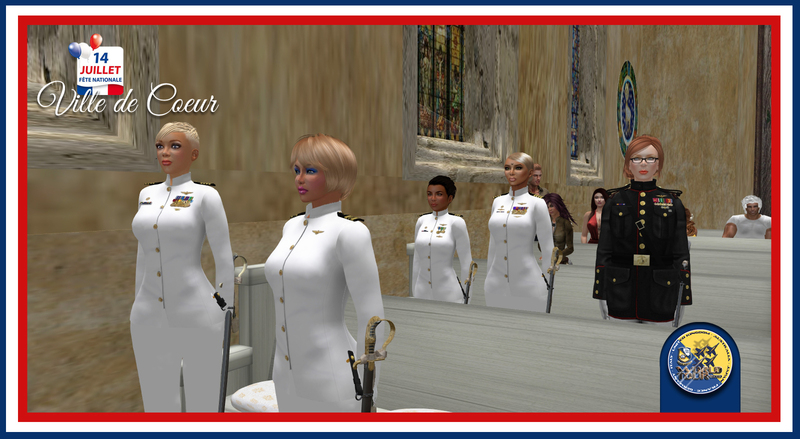 This July 8th at Naval Air Facility Eagles Nest, a long time planned ceremony took place. The Navy Flight Demonstration Team commanding officer and executive officer had been waiting to make the naming of NAFEN's main building a reality since its interior was completed some months ago. 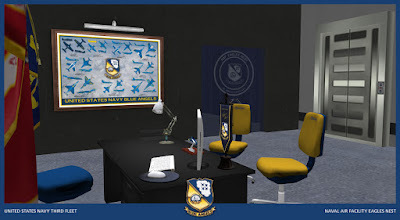 NAF Eagles Nest is the training facility of the USN Blue Angels in SL and it is for them what NAF El Centro is for the real life Blues - just as NAS Miramar in Second Life is for the demo team like real life NAS Pensacola. 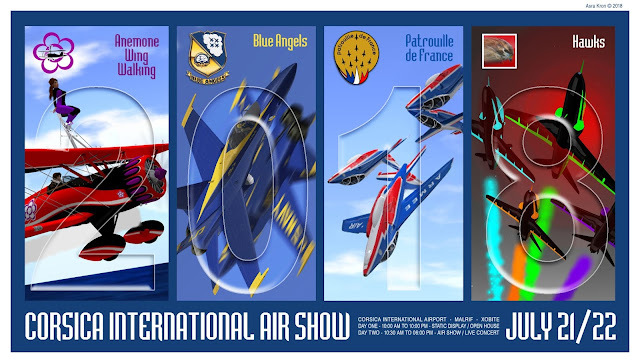 This is where the Blues were established first, back in 2015, and since then the support and generosity of Barry Foehammer, the region's owner, has been paramount for the lasting presence of the squadron in the region that is named after the real life Blue Angels. It was decided that these years of unwavering support and hardship deserved enduring recognition not only in words and awards, and indeed Commodore Foehammer has been awarded the title of Blue Angels "Booster" for his outstanding commitment to the squadron, but also in a more lasting and visible way that would pay tribute to his contribution every day and for all to see. Hence the naming of the main building in the facility "Commodore Barry Foehammer Building". 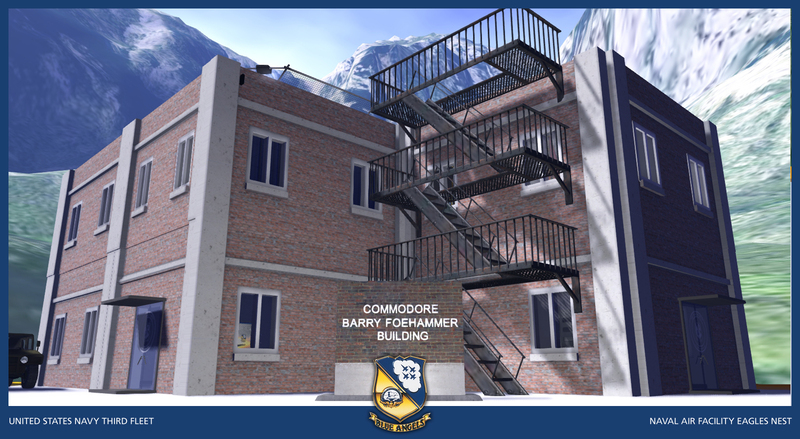 The Commodore was of course invited to the ceremony and here remains the public record of the day along with a short visual description of the building and its multiple purposes. As usual, click on the images to enlarge. The Commodore arrives at NAF Eagles Nest to see his name on the main building ID wall. CAPT. 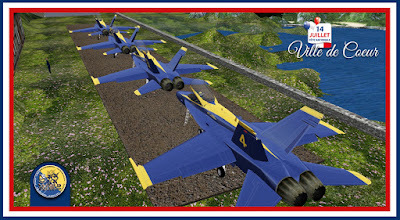 Vickster Kühn, NAFENCO and the Blue Angels Boss, CAPT. Asra Kron, the squadron XO and Blue Angel 7, and LCDR. 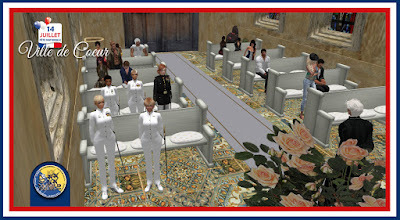 Jenny Kaz, the Blues Lead Solo, were present to dedicate the naming. 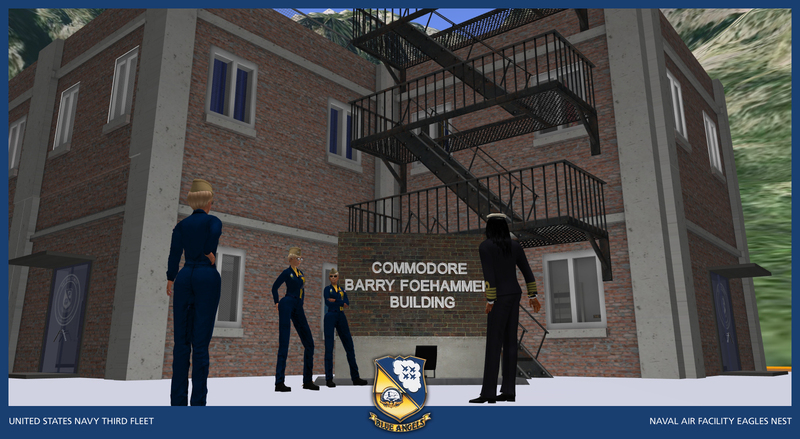 The Commodore looks back at LCDR. Kaz with a big smile on his face. 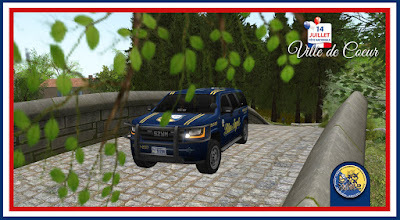 Recognition sometimes comes way too late and sometimes fails but the Blues made a point of ensuring this time it came true and in good time, after just a few months since the main building was finalized and operational. The ground floor of the building is where the "flying chairs" are. Intended for rundowns of demo pass lists and other special briefings, this area also provides a more relaxed setting for meetings and local official events. It is as well the place where the awards presented to the squadron are displayed. 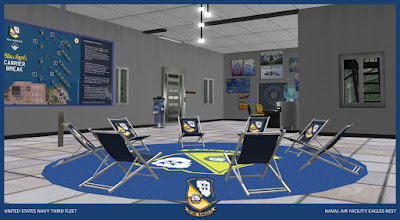 Another view of the ground floor open space. Visible on the background are the North access, the elevator and the XO desk. The XO's desk on the ground floor near the North door, surrounded by a selection of posters from demos the Blue Angels participated in during past Seasons. 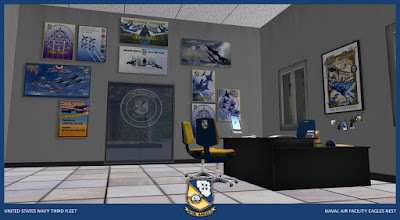 The poster on the wall behind the desk is a real life Blue Angels Homecoming edition. The second floor just out of the elevator, the Boss' office. CAPT. 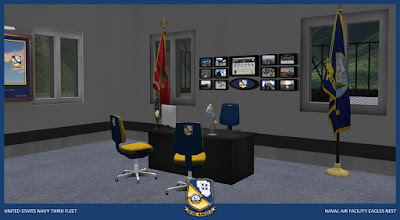 Kühn's desk is sided by the Navy and USMC colors and the walls are decked with Blues and personal mementos of a long and distinguished career as an aviator. The CO's desk from another angle, showing the elevator and the doors to the auditorium. Every inch of the building was optimized for functionality and is put to good use. 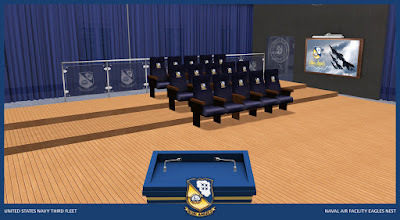 The inside of the Roy Marlin Voris Auditorium. 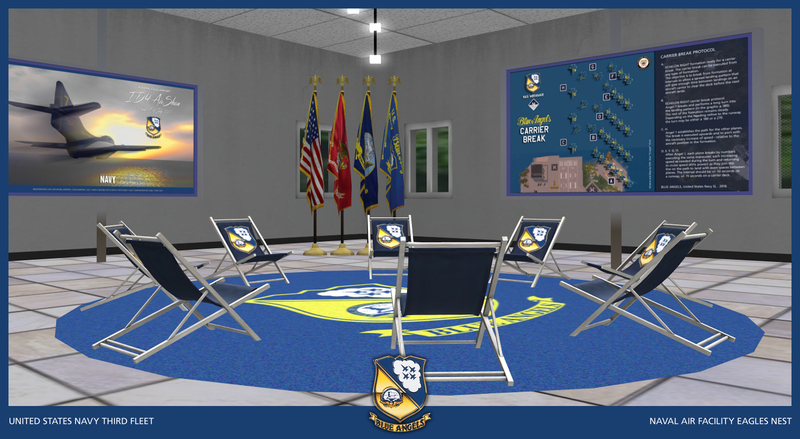 This is the official setting for most Blue Angels ceremonies and the location of choice for special briefings, awards and other functions. 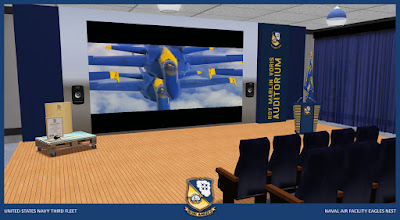 The big screen in the auditorium where the Blues view not only the available footage of their practices and demos, but especially real life reels of the squadron in action. The team's demos are based on the real Blue Angels playbook and seeing them on the big screen is part of the training protocol.